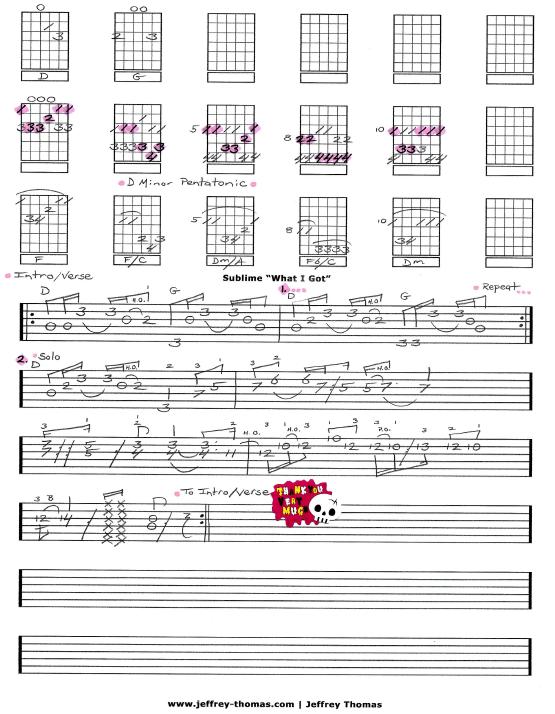 Sublime What I Got Free Guitar Tab by Jeffrey Thomas. Learn to play this acoustic classic by Sublime with my custom guitar tab arrangement. The song has a very simple structure of varied arpeggio patters from D to G and a solo based on D minor pentatonic. I have all 5 D minor pentatonic patterns with chord shapes and the solo from the recording notated. Want the full guitar tab for free? Go ahead and enter your email address in the form and I’ll send it to you. Looking to improve your guitar rhythm and lead skills? Make sure to fill out the Schedule A Free Lesson form to set up your free Skype guitar lesson. “What I Got” was ranked #83 in Rolling Stone Magazines 100 Greatest Guitar Songs Of All Time! Find more great online guitar tabs on my blog, video and tab pages.